ALL ABOARD: TRAVELING BY RAILROAD! Excited visitors hurry onto the train platform at the Baltimore and Ohio Railroad Museum in anticipation of a ride down the original right of way of the first commercial railroad in the United States. Even during the hottest days of summer or the bitter cold of winter, as many as 200 passengers of all ages attempt to satisfy the conductor with a loud “All Aboard!” that will allow them to escape the elements and settle into the comfort of the refurbished commuter cars. The mile-and-a-half ride takes museum visitors through an urban industrial neighborhood where predominately Irish immigrants once lived and worked on the grounds of the nearly one hundred acres of the B & O’s Mt. Clare Shops. The ride west ends at the site of the laying of the ceremonial “first stone” by then 90-year-old founder Charles Carroll of Carrollton on July 4th, 1828. He asserted at the time that laying the first stone for the B&O ranked a close second to another important act of his long life, that of signing the Declaration of Independence! Ironically, the first railroad passengers who traveled this same ground nearly 175 years ago were also motivated by the novelty and excitement of an excursion on a train. They too were not deterred by unpleasant weather. They crowded onto open-air like cars pulled by a single horse for a round trip fee of nine cents. Business was brisk. The Baltimore Gazette from July 1830 reports that even during an extended heat wave, the average receipts were more than $1,000 per week. They tell of travelers passing through Baltimore on other business going out of their way to be among the first to enjoy a ride on the new railroad. They would not be the last! When railroading began, it was intended to provide transportation services for shippers of products, not people. However, the B&O was one of the first American railroads to realize that passenger services would become a necessary part of operations as well. Mt. Clare is the site (not the building) that marks the beginning of the first common carrier railroad in the United States: the Baltimore & Ohio Railroad. 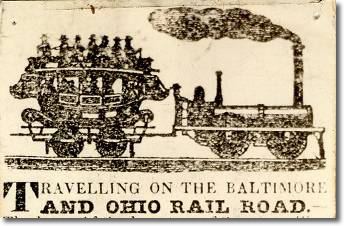 Passenger services officially began on May 24, 1830, however the railroad offered rides to curious citizens of Baltimore five months earlier before the line to Ellicotts Mills was completed. The first trains were pulled by horses because steam locomotive technology had not yet been adapted to American terrain. When steam locomotives finally became commonplace on American railroads however, the difference was astounding. One horse could pull a full train from Baltimore to Ellicott’s Mills in an hour and a half, but one locomotive pulling a full train could complete the same distance in thirty minutes. The convenience of speed was perhaps the only benefit for passengers traveling on the early railroads like the B&O. Passenger stations and services were far from luxurious or accommodating. Passenger cars were bumpy and uncomfortable, and traveling in general was highly dangerous. Train wrecks, derailments, and fires were frequent. Still, passenger services had a dramatic impact on American society. For the first time, the majority of Americans had the freedom to move and travel easily. Different types of Americans (white, African American, male, female, lower and upper class) were all traveling with the same service and at times in the same train. Although separate cars were quickly constructed to uphold social traditions of separation and segregation, these rules varied from region to region, railroad to railroad, and in some cases train to train. A visit to the B&O Railroad Museum enables students to see the evolution of passenger travel. Exhibits include pre-railroad vehicles such as a stagecoach and a Conestoga wagon, as well as a horse drawn “Pioneer” car consistent with the “roads to rails” theme. The collection includes examples of the earliest carriages put on “trucks” and pulled by steam locomotives during the 1830s. The journey through time continues through the historic roundhouse and into the backyard of the 40-acre museum site where numerous coaches representing different stages in the development of passenger travel are on display, some of which are accessible for walk through examination. Top off the visit with a ride on the “mile one express.” All aboard!